There is a limited understanding of the long-term impacts on the biomass production and the soil’s chemistry. This experiment was developed to simulate nine years of continuous use of human urine as a fertilizer with spinach. The data presented in this poster is on the biomass and does not included the soil analysis. The experiment was located in Arla, Himachal Pradesh, India and conducted from June to October, 2011. Performed with SAS software using Duncan pairwise procedure. 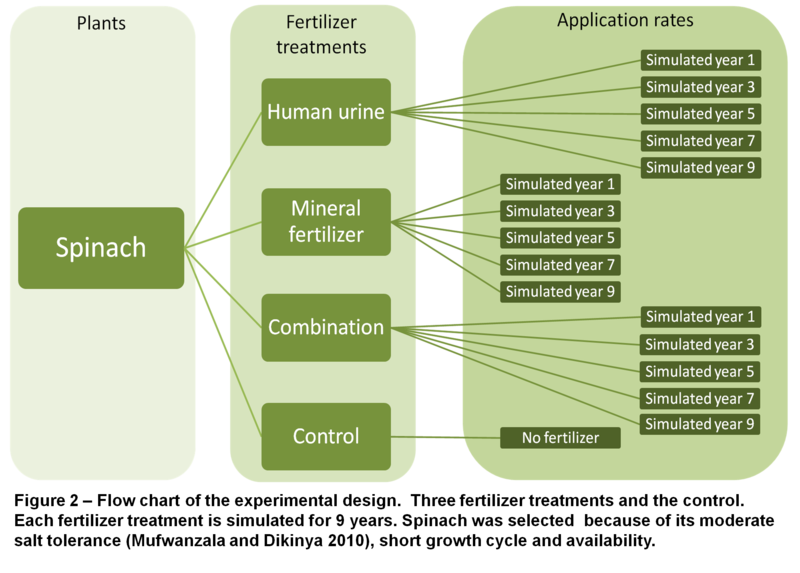 Not significantly different to the mineral fertilizer treatment, except for simulation year 9 where the average mass from the human urine treatment was significantly higher. 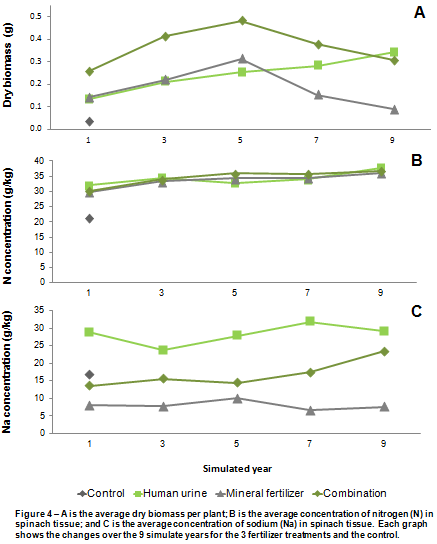 Concentrations of nitrogen in the spinach tissue (Figure 4-B)were not significant different between the three treatments (human urine, mineral and combination) at increasing simulated year indicating the assumption of 6 g of nitrogen per liter was correct. All treatments had significantly higher tissue nitrogen concentrations than the control. Farmers, especially those with out access to fertilizer, would benefit from using human urine as a fertilizer. Spinach grown with human urine produced a greater biomass than no fertilizer and produced equivalent biomass to synthetic fertilizer. Human urine is combination with additional phosphate and potassium overall produced the highest spinach biomass. With continuous use, the survival rate of the spinach with the human urine treatment was higher than with the mineral fertilizer. Salt sensitive plants may grow poorly in comparison. CRRAQ (2010). Guide de référence en fertilisation, Centre de référene en agriculture et agroalimentaire du Québec,. Guzha, E., I. Nhapi, et al. (2005). “An assessment of the effect of human faeces and urine on maize production and water productivity.” Physics and Chemistry of the Earth 30: 840-845. Kirchmann, H. and S. Pettersson (1995). 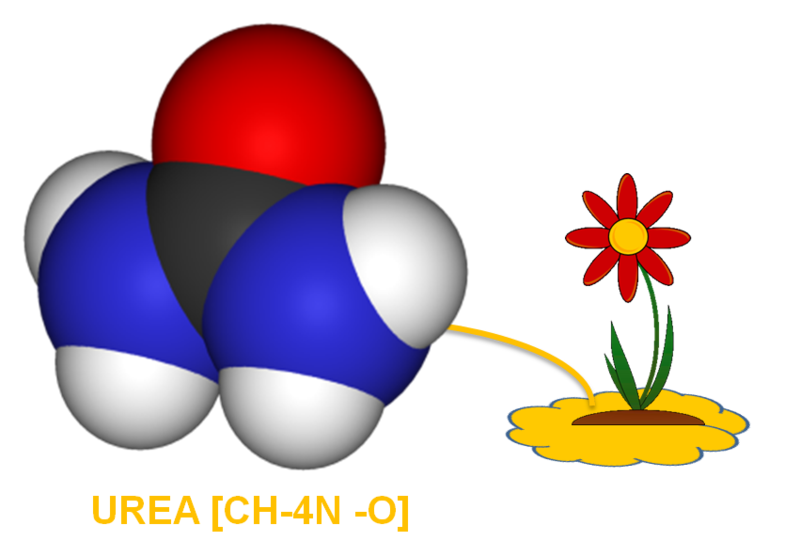 “Human urine – Chemical composition and fertilizer use efficiency.” Fertilizer Research 40: 149-154. Mnkeni, P. N. S., F. R. Kutu, et al. (2008). “Evaluation of human urine as a source of nutrients for selected vegetables and maize under tunnel house conditions in Eastern Cape, South Africa.” Waste management & research 26(132). Mufwanzala, N. and O. Dikinya (2010). “Impact of Poultry Manure and its Associated Salinity on the Growth and Yield of Spinach (Spinacea oleracea) and Carrot (Daucus carota).” International journal of agriculture and biology 12(4): 489-494. Pradhan, S. K., J. K. Holopainen, et al. (2010). “Human Urine and Wood Ash as Plant Nutrients for Red Beet (Beta vulgaris) Cultivation: Impacts on Yield Quality.” Journal of agriculture and food chemistry 58: 2034-2039. Putnam, D. F. (1971). Composition and concentrative properties of human urine. National Aeronautics and Space Administration Contractor Report. Huntington Beach, California, McDonnell Douglas Astronautics Company – Western Division. NASA CR-1802. Tidaker, P., B. Mattsson, et al. (2005). “Environmental impact of wheat production using human urine and mineral fertilisers – a scenario study.” Journal of Cleaner Production 15(2007): 52-62. Vinneras, B. (2002). Possibilites for sustainable nutrient recycling by faecal separation combined with urine diversion. Department of Agricultural Engineering. Uppsala, Swedish University of Agricultural Sciences. Doctoral: 88. The concentration of elements (see Table 1) in human excrement has diurnal fluctuations in individuals depending on dietary habits, hydration, perspiration, and level of physical work in the day (Heinonen-Tanski, Sjöblom et al. 2007). For example, a study in Sweden recently observed a 30% increase from the typical values of potassium in human urine probably due to the use of potassium supplement salt (Vinneras 2002). Cultures with higher meat consumption will urinate higher concentrations of nitrogen because of the increases protein content (Heinonen-Tanski, Sjöblom et al. 2007; Pradhan, Nerg et al. 2007). These fluctuations challenge the designing process of waste management systems. Table 1 are the Swedes standard values of the mass of waste we excrete on an annual base. Nitrogen, phosphate and potassium (N-P-K, macro nutrients required by plants) by mass account for about 80%, 50%, and 60%, respectively, in domestic waste water, more than feces (Kirchmann and Pettersson 1995; Höglund 2001; Vinneras 2002; Ganrot, Dave et al. 2006; Mnkeni, Kutu et al. 2008). Ganrot, Z., G. Dave, et al. (2006). “Recovery of N and P from human urine by freezing, struvite precipitation and adsorption to zeolite and active carbon.” Bioresource Technology 98: 3112-3121. Heinonen-Tanski, H., A. Sjöblom, et al. (2007). “Pure human urine is a good fertilizer for cucumbers.” Bioresource Technology 98: 214-217. Pradhan, S., A.-M. Nerg, et al. (2007). “Use of Human Urine Fertilizer in Cultivation of cabbage (Brassica oleracea)––Impacts on Chemical, Microbial, and Flavor Quality.” Journal of agriculture and food chemistry 55: 8657-8663. It can be hard to find a toilet… where to go when there isn’t one? There are over 2.6 million people around the world who don’t such access. And about 1.6 million children are dying each it because of it. Join me on everybodypoohs.com, as once a week I’ll explore such questions through stories about where people’s pooh is going. * Adequate sanitation is defined as: having access to improved sanitation facilities, which includes flush or pour-flush to piped-sewer system; septic tank or pit latrine; ventilated improved pit latrine (VIP); latrine with slab; and composting toilet. 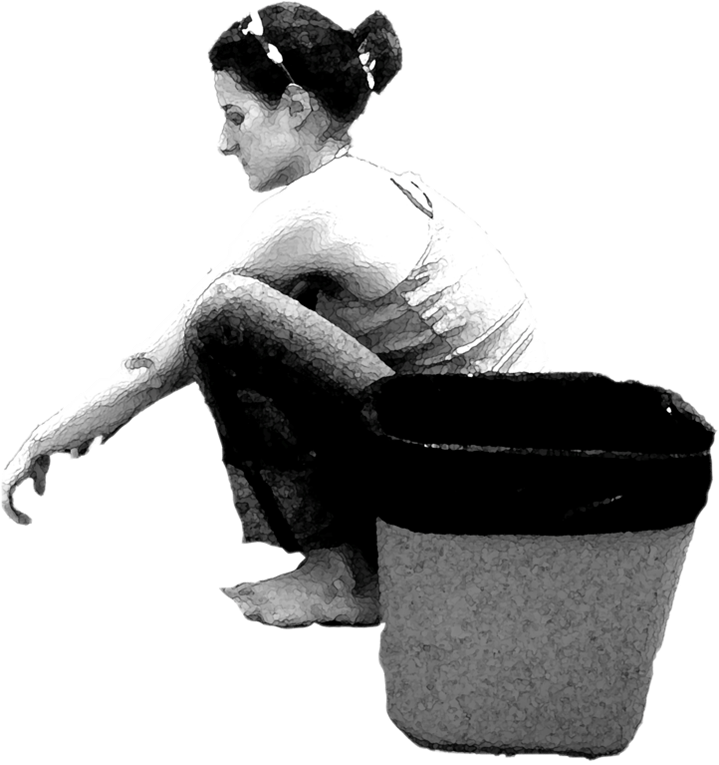 Unimproved sanitation facilities are flush or pour-flush to elsewhere; latrine without slab or open-pit; bucket; hanging toilet or hanging latrine; no facilities or bush or field.